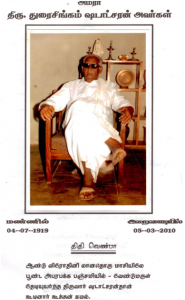 Mr. Duraisingam Shadadcharan is a person who was in a fatherly position to me. Tharmakaththaa of Sivachchandra Mouleesar Saanthanayaki Amman temple Madduvil kaluvam (madduvil Sivan Temple) and former Labour officer. A straight forward who upheld his traditions, customs and practices without fear or panic of the consequences. His house is the Naarchar type found at the edge of Navali that sustain the culture as he himself. Ever dependable Shadadcharan Aiya was a counselor, Lawyer and Protector in one. Over a third of my life he has been many in one to me. Quick to the rescue for any s.o.s.